Most of us receive many emails that need the same reply. Like if you offer any web service, and people or companies often contact you for quotes or the charges for the different services you give. All these emails need the same reply. Students also need to reply with the same message or documents for any assignment. So Batch Reply for Gmail is an extension for Chrome which can let you mark multiple emails at once and allows you to reply them altogether with the same content. What This Extension Does ? The extension simply adds a “Reply” button in the menu bar, which is displayed when you mark one or more emails. When you click on “Reply” the extension fetches all the email addresses from where the emails you selected came from and opens a new compose email window containing all those addresses in the “To” field and hence you can send the same reply and/or files to all the email addresses. 1. Run Google Chrome. If you don’t have it download it from here. 2. 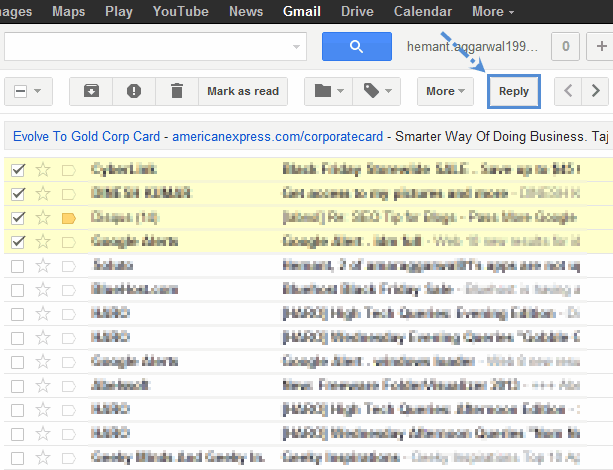 Install Batch Reply For Gmail from the Chrome extensions page. 3. Now just open Gmail and login to your account if not already logged in. 4. Mark some Emails that require the same reply from your end and click on the new “Reply” button which is created by the extension. You will see that a new compose email window opens, here you can compose your Email and this email will be sent to the addresses you marked. P.S. This extension is useful for everyone of us in some way or the other. For me it was quite a relief, because many people email me for becoming a partner in my website and my simple reply is to encouraging them for being an author. So I mark all the emails and send the same Email to all of them.